At the end of Bermondsey St, tucked away in an odd looking building on the corner, is a café known as the Watch House. Stepping inside you are met with a very strange impression: this is far from your normal rectangular room. Instead an octagonal space, complete with Victorian style tiling and wood burning stove greets you. There are about five small tables inside, which were all occupied (some shared) when we arrived late in the lunch hour. So we sat at a table outside, although there was also bench seating on the other side of the door and a lovely park just next door, the old St Mary Magdalen graveyard. The building itself dates from the time when the “watch house” was the base for a makeshift local constabulary that would monitor the local area ensuring that no body-snatchers were operating in the graveyard next door. The body snatchers used to ‘acquire’ recently buried bodies for use in anatomy classes at the capital’s teaching hospitals. Nowadays, as with many other disused burial grounds in London, the graveyard next door has been transformed into a park. 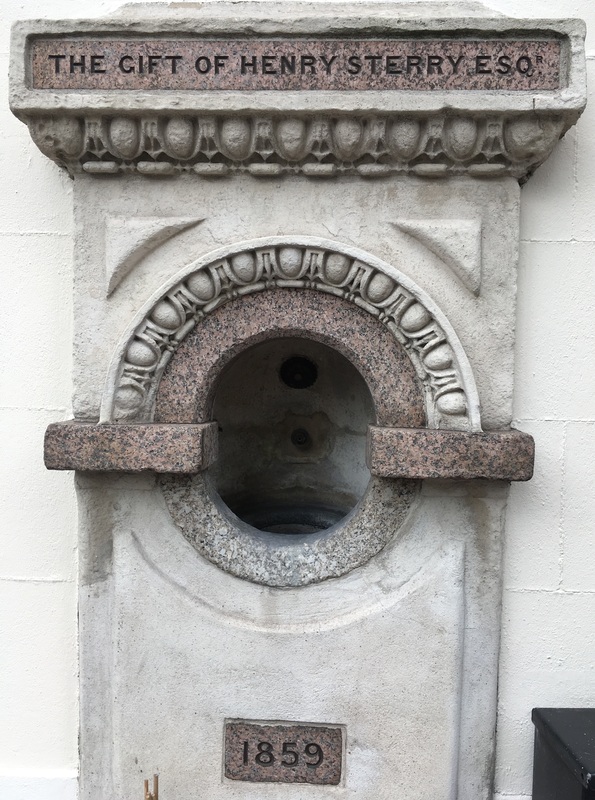 On the other side of the café, a drinking fountain (the gift of a Henry Sterry Esq.) is embedded into the wall. 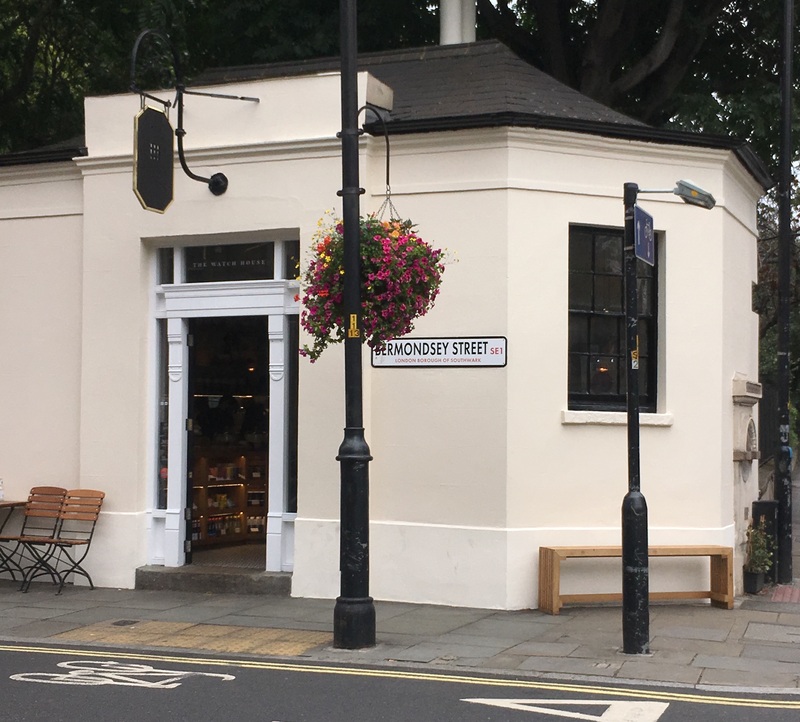 An interesting feature reminding us of the drive to provide drinking water to London’s population both then and now with the newly installed fountains at the nearby Borough Market. What fantastic colour in this filter. As I placed my V60 on the table outside, the light shone through it making the coffee appear to glow with a deep red tinge. 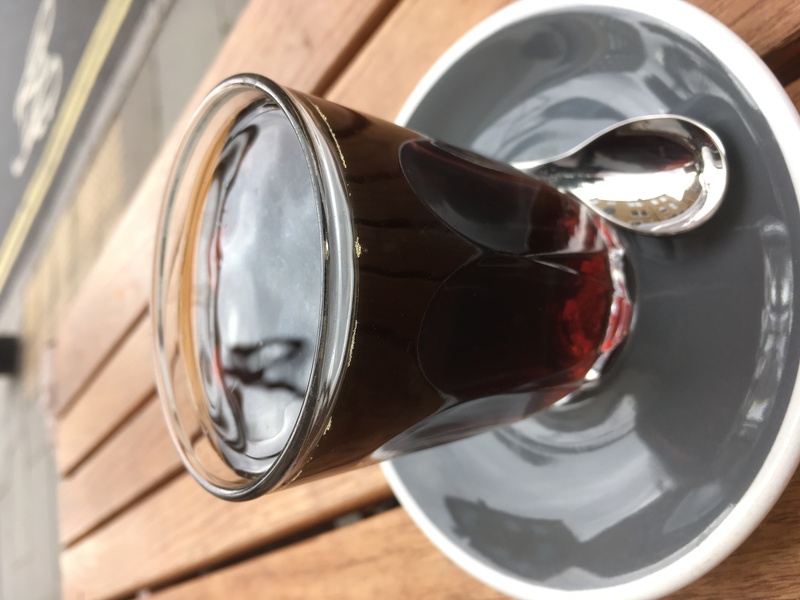 Temporarily ignoring my normal idea that such transient beauty can’t be captured, I tried to photograph it, an endeavour that predictably failed to capture the full radiance of the cup. Nonetheless, the clear red coffee did not have significant sediment at the bottom of the cup. Perhaps this is not surprising, it was a V60. 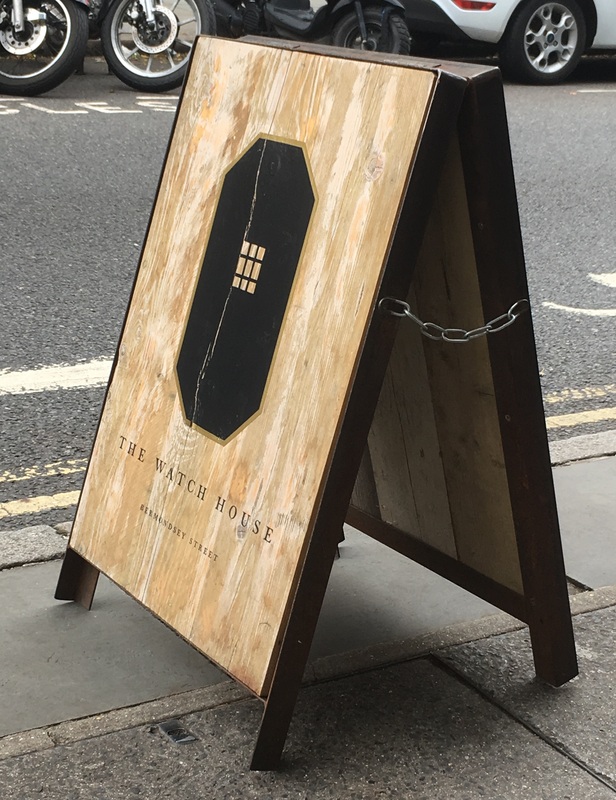 But nevertheless this lack of sediment has a connection with the water fountains both at the Watch House and at Borough Market and the wood burning stove. You could even make a macabre link to the graveyard next door. But without pursuing that last one too much, the link is Antoine Lavoisier (1743-1794) and the transmutation, or not, of water into earth. The problem was this: In the early seventeenth century Jon Baptist Van Helmont had planted a 5lb (2.3 kg) willow tree into a pot of soil of mass 200 lb (91 kg)¹. He covered the pot of soil and only allowed rainwater into the tree/pot system for 5 years. At the end of his experiment, the mass of soil was unchanged but the willow tree was now 169 lb 3 oz (76.8 kg). Clearly, the “element” water had transmuted into the “element” earth* and so added to the mass of the tree. A few years later and scientists boiling distilled water (which had of course been purified by previous boiling) noticed that there was always a solid residue left after the water had boiled away². Another piece of evidence for the transmutation of water into earth. Lavoisier, who became known as the father of modern chemistry, thought differently. He had been interested in obtaining clean, safe drinking water for the inhabitants of Paris and had noticed that when rainwater was repeatedly distilled, the amount of solid residue left after boiling decreased with each distillation. How was this reconcilable with the idea that each time you boiled water part of it became the element earth? But if water wasn’t ‘transmuting’ into earth, what could explain the solid residues observed by the other scientists of his day? Lavoisier suspected the potash or soda used in making the glass vessels used in the experiments. He thought that this could be dissolving out of the vessels when the water was boiled, leaving what looked like a solid residue at the bottom of the cup². To demonstrate that this could be the case, Lavoisier took a sealed container of water called a ‘Pelican’ (which has two arms to allow the water vapour to cool and drip back down to the base of the unit). He first weighed the water and the vessel, separately and together and then boiled the water in the sealed pelican for 100 days. After 100 days he weighed the container-water system again. The total mass had not changed. However, when they were weighed separately, something odd had happened. The glass vessel (the pelican) had lost some mass while solid salts had appeared in the vessel. Although these salts weighed slightly more than the mass lost by the pelican container, Lavoisier considered the discrepancy within error thereby showing that the ‘transmutation’ observed by other scientists was actually salt dissolving out of the glass vessel. Lavoisier’s experiments were an important contribution to the development of experimental method as well as a refutation of the old idea of the transmutation of the elements earth-air-fire-water. The fountain on the side of the Watch House. How had a need for supplying the public with drinking water shaped our scientific thinking? Which leaves one last connection: the wood stove. Since the dawn of humanity, there has been the question “what is fire?”. By the time of Lavoisier, fire was explained by the idea that matter contained more or less “phlogiston”. Something could catch fire if it contained a large amount of phlogiston, it would not ignite were it to have too little phlogiston³. One observation clearly explained by the phlogiston theory was the observation that a burning candle, covered by a glass bell jar, would extinguish itself. The idea was that the candle (which contained phlogiston) released that phlogiston into the air. If the candle burned within a jar, the air surrounding the candle would became saturated with phlogiston. Once saturated, the air could ‘hold’ no more phlogiston so none could escape the candle wick. This would mean that the flame would go out. Lavoisier, now recognised as one of the three independent co-discoverers of oxygen, showed that oxygen, not phlogiston, was needed for burning to occur. The question is how did he do it? And a question for you, when you are enjoying your sediment free delicious coffee next to a warming wood fire: how would you? *to be fair to Van Helmont, it is hard to blame him for arriving at this conclusion. It was still a few centuries before photosynthesis was discovered and the idea of the four elements of fire, earth, water and air was still active in his time.